We could not help but notice this article "Ethical Sourcing - Securing Values as well as Value in the Supply Chain" in our travels around the web. It seems that the revolution in the clothing industry, with fair trade, eco friendly and organic products taking up more and more shelf space, has been spotted by those outside the industry in the consulting speak worlds of ERP and PDM. For those not in the know, that's Enterprise Resource Planning and Product Development Management. Wiser now? Maybe. Let's put it another way. The writer of the article would have you think that the romantic vision of the buyer from a fashion store getting on a tiny single prop plane to some remote Indonesian island to sign a contact to supply garments to the UK high street on the verandah of a colonial style 19th century home is well and truly dead. This vision is replaced, yes, by a computer which at one end measures what's shifting off the shelves and at the other end evaluates the supplier options in terms of ethical credentials and price to automatically order just the right amount of clothing from the right supplier at the best price and move those garments to hit the shelves in teh High Street just before they become empty. "User configurable fields allow you to input information regarding aspects such as a supplier's child labour avoidance, management accountability, wages and working hours. From this data Syscom PDM calculates a colour-coded ethical trading rating for each supplier". "Having software in place that provides.... traceability is crucial. Choose a system that offers multi-dimensional item coding.... allows goods and materials to be traced through variable sourcing, manufacturing and finishing processes, creating transparency across the supply chain". It will be some time before Pier 32 installs an ERP system. We'll be using good old human contact for a while yet. But we're fascinated to see how changes in the clothing industry have been noticed outside that industry and the importance of ethical issues spreads to suppliers not normally associated with high ethical awareness. With much of the globe's clothing production being concentrated in Asia it's good to see signs that many ethical and environmental values are being focussed on by many producers in Asia. And this, it seems, is a reaction to the general trend in the USA and Europe towards a more ethical outlook rather than as the direct result of Western companies intervening to force production. It's in anticipation of the market moving that way. Producers accept the increased cost of eco-friendly production - but a worry is the additional cost of accreditation without which eco-friendly claims are viewed with submission. Here at Pier 32, aside from the even more stringent organic certifications, it is the Oeko-Tex environmental standard you will find on much of the clothing we sell. Look out for it when ordering your next printed t-shirts. schools that have participated on a volunteering project to perform all in the aid of raising money for a charity. The aim of the society is to spread the good news of the Jesus Christ on Campus through Gospel music and this event is the centrepiece of their year. When they were looking for a company to print T-shirts for their concert, they found Pier 32. They were very excited at the prospect of using us - not only were we extremely competitive in our prices but also they liked our environmentally friendly and ethical credentials. They were thrilled even more when they found out that we could sponsor them! They were pleased that while we were volunteering and raising money for our charity this year in purchasing our concert T-shirts we were also choosing an environmentally friendly company. But it went further - they worked with our design team to get the T-shirts, bearing the "No Limits" slogan and artwork, right and felt that Pier 32 really brought their design to life - they were exceptionally pleased with our end product. Judging by the photo from the performance itself, they and their audience had a great night! 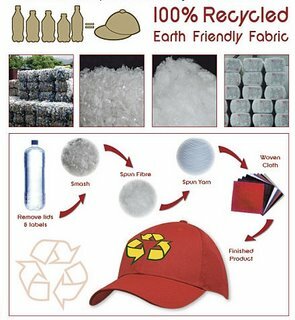 Recycle your plastic, wear an EcoCap! It's our newest line in eco-friendly clothing, the EcoCap is constructed from recycled PET plastic bottles, the sort that contains bottled water or fizzy drinks and which would take thousands of years to decompose if sent to landfill. You may imagine that it is simply recycled into more plastic bottles but, no, it can undergo a metamorphosis into something you wear on your head! To the right is a great illustration of what goes into the recycling process. You might imagine that labels etc are carefully removed before the plastic is processed but in fact the bottles are shredded whole and then processed to separate undesirable elements and produce pure 'PET flakes'. From this point the PET flakes are used as the raw material for a range of products that would otherwise be made of polyester, and that includes clothing. About three-quarters of the PET flakes are used to make polyester fabric products. Much of the remainder is extruded into plastic sheet to construct containers, or be compounded for moulding applications. For clothing, the PET flakes are spun into yarn which is then woven into cloth before becoming a baseball cap to carry your printed or embroidered custom logo. 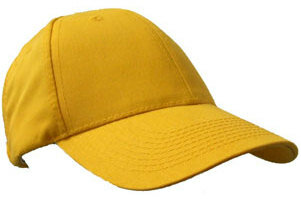 Go to our regular site to see more examples of this new recycled eco-friendly baseball cap which is available in two styles and a huge range of colours.